The name of a search program, must match a name for a search program in this document. 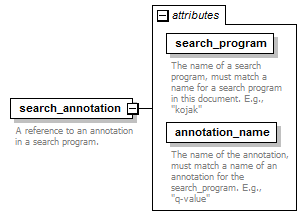 E.g., "kojak"
The name of the annotation, must match a name of an annotation for the search_program. E.g., "q-value"
A reference to an annotation in a search program.